Have you ever sat at the Preferences page, scrolling through your list of avatars and wondering how on Neopia you're going to choose just ONE to use? Unless you've invested in several Green Neoboard Pens from the NC Mall, you'll have to make this decision eventually. Either way, you can only use one avatar each time you post! So what's it going to be? Don’t let it make your head spin faster than the Wheel of Excitement. If you're tired of always using the same avatar, or you find that everyone is using the one you are, this article could be very helpful. If you're stuck in an avatar rut, try using something different! For example, if you generally use item avatars, maybe it's time to test-drive a game avatar like Grarrl Keno! Similarly, the Easter Cybunny avatar doesn’t necessarily fit the mood all year round. Perhaps using one of the often overlooked 'clickable' or default avatars that suits your fancy would be a nice change from that ultra-rare one you've been using ever since you got it. Think outside the box! Instead of using your newest avatar, think back to your early collecting days and try one of the first you ever found. You might find yourself very happy to remember that time you saw Jazzmosis in concert... and enjoy recalling how proud you were to earn a secret avatar! A pretty common (but never boring) way to go about selecting an avatar to use is to try and match your mood! Ever-changing, this idea leaves room for you to switch your avatar as often as you like. If you’re happy, try something with warm colours like Faerie Pteri or Meerca Chase! If you’re feeling evil or mischievous, however, maybe it’s a good day for Pteri – Darigan or I Taunt the Pant Devil. Even better, if you’re tired and grumpy from a long day of work or school... there is always Mutant Draik – Back Off! Another way is to choose an avatar based on the colours you like. Chances are, if you love the colour purple, an avatar like Darigan Peophin or Freaky Factory will make you smile every time you use it on the Neoboards. With the arrival of our active pets with us on the Neoboards, many more possibilities for choosing an avatar have also emerged. Many users like to match their avatar colours with their font colours – now taking it one step further, you can draw inspiration from your favourite pet to choose a matching avatar. For example, a grey pet would look just perfect with the Grey Wocky - *sigh* avatar. You don’t have to have rare or painted pets to try this, though. Any blue pet would look good with the Evil Fuzzle – BOO! avatar – or if you’ve been lucky enough to win a Starry Paint Brush at Key Quest, you could pair your active pet with the Kau – Starry avatar. What fun! If you don’t feel like pairing your avatar with your signature or pet, you can always try to match it with something that suits your personality. Are you a soda-lover? The Achyfi! avatar would fit you well. Think about things you like – maybe a certain avatar reminds you of your beloved cat, or your childhood fascination with slugs (ew!). On occasion, I’ve even chosen an avatar that goes with the shopkeeper or shield showing on my user lookup. Anything goes! Another nice idea is pulling out a line from your favourite (Neopets-appropriate) song or movie, and using an avatar to suit the mood or tone behind it. As well as helping you find an avatar to use, you could also end up meeting people on the Neoboards with the same interests! 5. What Are You Proud Of? One of the most popular ways of selecting an avatar is to choose one which represents an achievement you’ve made on the site. When you finally scrape up that last bit of collateral to borrow the Zafara Double Agent Plushie, I’m sure you will want to show off your new avatar! This is a great idea (just don’t fall off your chair in excitement!). Similarly, after hours of aiming in Faerie Bubbles, there’s no doubt you’ll be happy to use the avatar when all your hard work pays off. If you have trouble obtaining avatars like this, you can always spotlight your brand new pet paint job as mentioned earlier, or pick a random avatar that you know you were especially lucky to get. 6. What’s Up In Neopia? If even after the previous ideas you’re still at a loss for which avatar to choose... never fear! I have one more suggestion. Get in the spirit by wearing an avatar that matches the season or a fun site event! 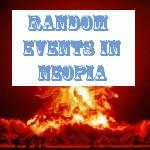 There is always something exciting going on in Neopia. For example, Gamesmaster AAA is a great choice during the month of March, as is Top Gamer. If you (unfortunately) live somewhere that is still freezing at this time of year, Wocky – Snow Day would work as well. This idea carries on through all twelve months of the year! When summer hits, you can bust out that A Day At The Beach avatar you’ve been eyeing (or use it now to remind you of warm days to come!). Get creative! If it’s raining in Neopia Central, maybe Gloomy is a good choice. Also, don’t forget that December is a good time to use a festive avatar like Seasonal Attack Pea or Plastic Fir. You’ll never lack inspiration if you keep track of the News page! So, there you have it. Hopefully you have added a few more strategies to your collection in deciding which avatar to choose on the Neoboards. If you know which one you would love to use but haven’t quite obtained it yet, good luck and keep trying! One more thing to remember... if all else fails, close your eyes, hold your breath, and select at random!